Compatibility settings are listed under the Compatibility tab when you right-click on executable files and select properties. 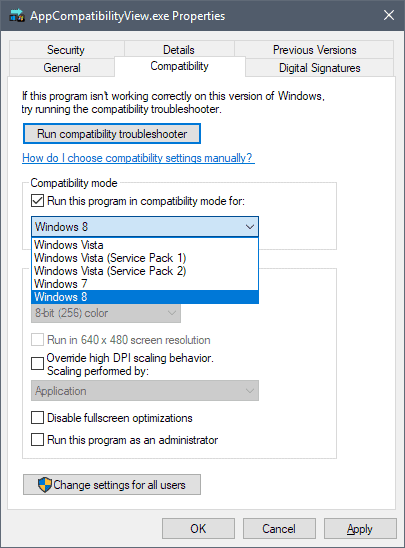 You may run the compatibility troubleshooter, change the compatibility mode to another version of Windows, or modify compatibility settings. Sometimes, you may even want to run programs that work fine in compatibility mode, for example, to use a different interface designed for older versions of Windows or disable features that are only available in certain versions of Windows. AppCompatibilityView lists all executable files with custom compatibility settings when you launch it. The portable program is available for 32-bit and 64-bit versions of Windows starting with Windows XP and all the way up to Windows 10. 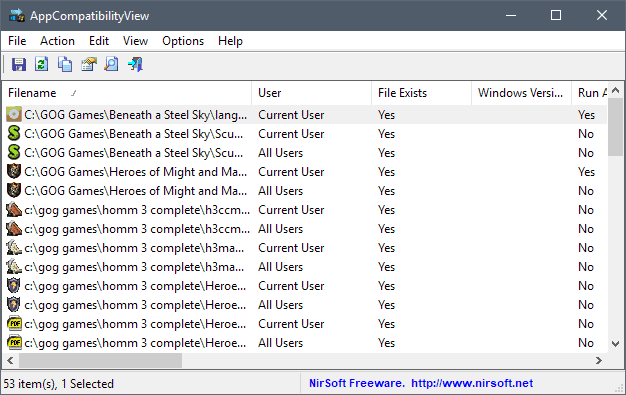 Nirsoft's program pulls the information from the Windows Registry where it is stored under HKEY_CURRENT_USER\Software\Microsoft\Windows NT\CurrentVersion\AppCompatFlags\Layers. System path and file name. Set to "run as admin". AppCompatibilityView gives you a quick overview of all compatibility settings. One useful feature of the program is that it highlights compatibility settings for programs that are not on the system anymore. Any program listed with a red background indicates that the application is no longer on the system. You can delete any program from the list with a tap on the Delete-key after selecting it. Note that you do need to run the program with elevated rights to delete compatibility settings for programs under the "all users" context. Another handy feature is the ability to change the compatibility mode and settings from within the program interface. Just right-click on any listed program and use the right-click menu to change compatibility settings for it. One thing that is missing is the option to add new programs to the listing. AppCompatibilityView comes with the usual options to export data to various file formats, and to run the program from the command line to generate reports automatically. AppCompatibilityView is a specialized program that most Windows users may have little use for; it is lightweight and portable on the other hand, and can be useful to get an overview of all compatibility settings on a system, change settings for specific programs, or remove programs. sort of odd, but when on main nirsoft page and all utilities this app not listed. A first post showed up while I was posting…. ” WHERE ARE THE TWO COMMENTS I POSTED HERE? The two comments came back (and counters were reset). But reloading the page brought me back to square zero. Now, I’m anticipating everything will come back after pressing “POST COMMENT”.